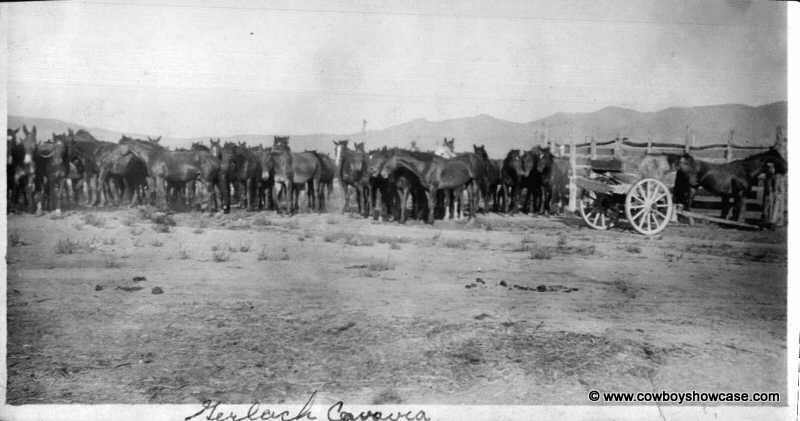 Around 1906, the Gerlach Cattle Company, headquartered in northwestern Nevada near the town of Gerlach, ran cattle in the surrounding high desert country. This big country was wide open with no barbwire fences. When time came to work the cattle herd, “reps” or “stray riders” as they were sometimes called, came from the neighboring ranches to help with the cattle work and to claim their owners branded strays (cattle that had drifted onto the Gerlach range) These men brought with them their bedroll and extra saddle horses to use while they were working the cattle. These spare horses were turned out with the Gerlach cavietta (a group of horses & mules) when they were not being ridden. There were no fenced horse pastures in those days so to be able to catch their horses they necked the extra horse to a mule with a short length of rope. The rope was tied with a bowline knot so it would not choke the horse or mule when tied around the neck. Mules would partner up with bell mare (a female horse with a bell around its neck.) When the cavietta was wrangled in the dark before daylight the wrangler could find the horse herd by the sound of the horse bell. The mule with the extra horse tied to it followed the bell mare into the rope corral. The “rep” claimed his horse for the day. This was a clever way to keep track of extra saddle horses in the days before barbwire and fenced horse pastures. Note the mule with the white snip on his nose on the left in the photo above. He is "necked" to a rep's horse. Photo courtesy of George Parman, Eureka, Nevada, click on photo for larger view.